Fire suppression systems are the most important part of construction because they protect both life and property. The National Fire Protection Association has fire code 5000 specifically dedicated to fire suppression requirements for new building construction. We strive to provide fire suppression tanks that meet NFPA 22 standards so you can complete construction economically and up to code. Fire protection engineers understand that construction projects need to incorporate efficient, cost-effective fire suppression systems that include adequate on-site water storage. During an emergency, fire suppression tanks can supply water to sprinkler systems or firefighters can attach a fire hose to the tank's outlet to suppress the fire. Whether you are in residential, industrial or commercial construction, we have a solution for your job site or firefighting water storage needs. The construction field is vast and varied, making up over seven percent of the global workforce and ten percent of global GDP. As a result, the logistics and management of water on and off site is a growing concern and among the top priorities of most construction sites. We strive to provide a variety of USA-made liquid storage solutions to meet your needs from fire protection, dust suppression, drinking water storage to secondary containment. Questions? 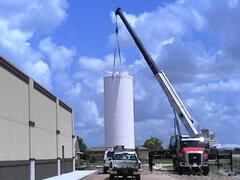 Contact us at 1-772-646-0597 to discuss your construction project and water storage needs! To explore required compliance elements and how GEI Works fire water storage solutions meet these parameters, visit our Commercial Fire Protection Page or our Regulations Page to explore a catalog of resources applicable to fire suppression tanks. Mars corrugated tanks are a field-erected, semi-permanent solution for fire protection and bulk water storage. They are capable of storing potable drinking water, rainwater, gray water, or firefighting water. These water storage tanks can be configured for Dual Use to meet fire suppression tank regulations. Corrugated storage tanks are corrosion resistant, reusable, space efficient, UV resistant, ultra-durable, and long-lasting. 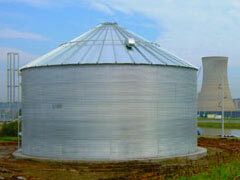 Fiberglass tanks are a popular bulk liquid storage option because of their corrosion and extreme weather resistances. Capable of being retrofitted for domestic and industrial fire protection systems and easily installed on-site, fiberglass tanks are a long-term solution to any fire water storage need. Vertical plastic water tanks are capable of storing water for fire suppression as well as potable due to their FDA-approved interior lining and dark green or black color. Poly tanks are lighter weight and easier to install compared to corrugated and fiberglass tanks. Argo water trailers are a mobile water storage option that can carry potable and non-potable water to nearly any location. These are capable of dispensing water in both low and high volumes and can deliver water or act as a fire or dust suppressant on a construction site with the rear spray bar attachment. Water skids share the same capabilities as water trailers but with a much lower profile. These skids can be placed into the bed of a truck or laid on top of a flatbed truck and operated in the same capacity as a water trailer by transporting potable or non-potable water or acting as a dust suppressant. GEI Works offers a variety of Stormwater Pollution Prevention Solutions for managing job site runoff including liners, geotextiles, erosion control, dewatering, storm drain filters, turbidity barriers, water trailers, and more. Call us today at 1-772-646-0597 to discuss your construction job site needs or request a quote below, we're happy to find the right erosion control and fire suppression solutions for you!